In this article, we will go over what exposure compensation is on a digital camera and how you can take advantage of it to make adjustments to your exposure when shooting in camera modes such as aperture priority, shutter priority, program mode and other scene modes of your camera. Every modern camera today has a built-in capability to adjust exposure settings in order to make it easier to properly expose images. In simple terms, the idea is to be able to control the brightness of an image, so that it does not end up looking too bright or too dark. To be able to do this, one has to use the Exposure Compensation feature, which is typically provided either as a dedicated button on a camera, or as a dial that one can move from positive exposure compensation to negative. Let’s take a look at how you can utilize this great feature on your camera and take a full control of your exposure. Before we show you where you can find the exposure compensation feature on your camera, let’s explore what it does and in what camera modes the feature can be used. But first, it helps to have a good understanding of exposure, which is the sum total of the three most important settings in all of photography: shutter speed, aperture, and ISO. Collectively, these form what is known as the exposure triangle. Exposure Compensation allows photographers to override exposure settings picked by camera’s light meter, in order to darken or brighten images before they are captured. Since camera meters work by evaluating light reflected off subjects and are standardized on middle gray (also known as 18% gray), any time a camera is pointed at something very dark, the meter will work the opposite way by brightening up the exposure, whereas a very bright subject will cause the meter to darken the exposure. This is done in order to get as close to the middle gray as possible, so that the resulting image is not too dark or too bright. 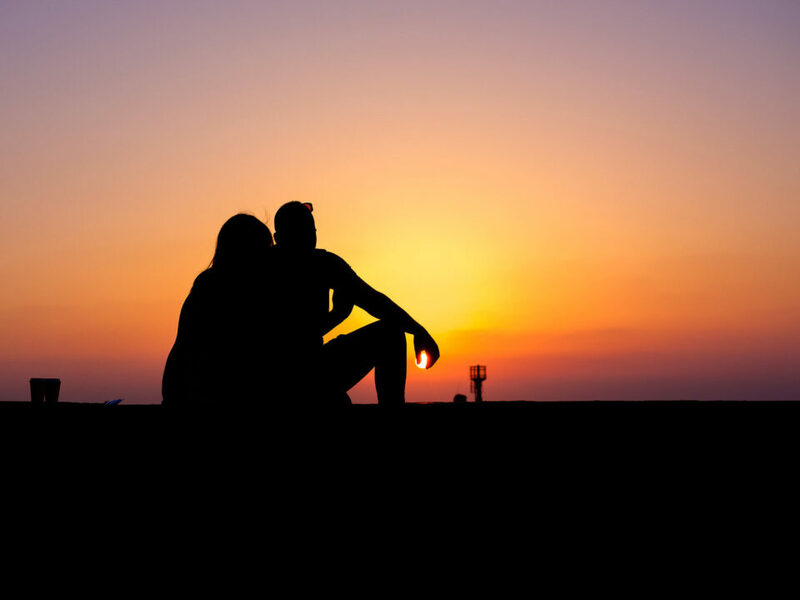 While this works out quite well in most cases, one might experience overexposure or underexposure in more challenging lighting conditions, where the camera meter might be adjusting the exposure too aggressively. This is where Exposure Compensation comes into play, with photographer manually taking control of the brightness of the image and overriding it using the exposure compensation feature of the camera. While shooting in Aperture Priority mode, the camera’s meter ended up underexposing the image, because the scene was rather challenging – the sky and the white sand in the foreground were bright, so the camera ended up darkening the whole image, which resulted in my subjects in the scene appearing way too dark. The image is now properly exposed, with the whole scene appearing much brighter compared to what the camera thought was the right brightness. By using the Exposure Compensation feature of the camera, I was able to take care of the problem in a matter of seconds. Note: if you are wondering how different metering modes impact your images, please see our detailed article on Camera Metering Modes. In order to use exposure compensation, you must be in one of the camera modes that utilizes the camera meter, such as aperture priority, shutter priority, program mode, or any other “scene” mode that performs automatic exposure adjustments. Unless one has Auto ISO turned on, exposure compensation will do absolutely nothing in Manual mode. Once the proper camera mode is selected, it will be possible to adjust the brightness of the image by using the exposure compensation feature of the camera. 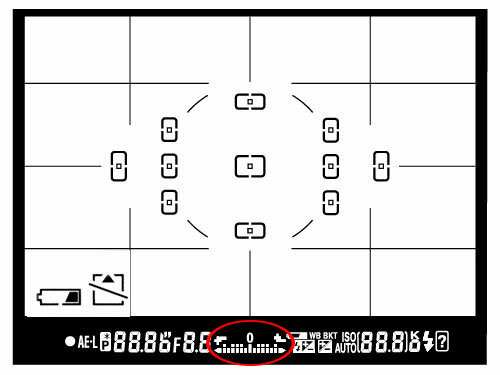 And if you cannot find such a button, there might be a dial on the top or the back of the camera that goes from a negative value to a positive value, such as -3 to +3, with small increments in between. If you are having a hard time finding the exposure compensation button / dial, please check your camera manual for details. Using exposure compensation is very easy. If an image appears to be dark, you dial a positive number (+EV), whereas if the image appears to be bright, you dial a negative number (-EV). 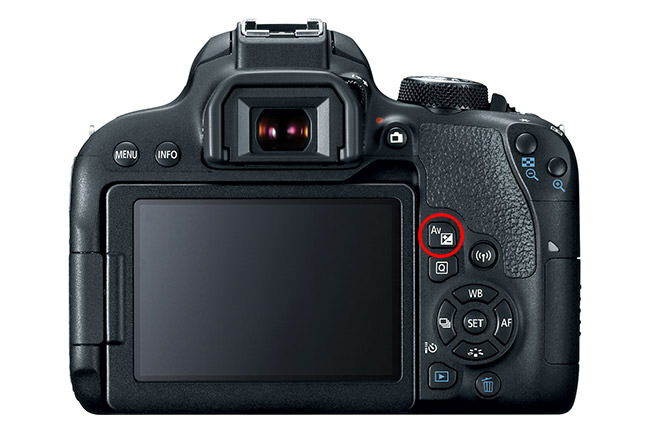 For cameras that have a button, you will need to hold the button and rotate one of the thumb dials, or press it once and use the LCD screen to adjust the exposure value. For cameras that have a dial it is even simpler – all you have to do is move it in the proper direction and your exposure should get adjusted accordingly. As you start making adjustments to your exposure through exposure compensation, you will notice a bar going to the left or to the right of the middle “0” value, which indicates that you are dialing negative (-) or positive (+) exposure compensation (if you have never used this feature, you might not even see the area highlighted in red until an exposure compensation value is added). Once you make adjustments to exposure compensation, the +- EV values will be shown in the LCD and the EVF. If you cannot see those values after making changes, you might need to turn on informational overlays from the camera menu. When shooting in Manual Mode, the only variable that can change is Camera ISO, but it first has to be set to Auto ISO, as pointed out earlier. It would work similarly as in the above cases, except both aperture and shutter speed would remain constant. Although I have stated above that metering systems on cameras standardize on middle gray, many of the modern cameras now come with sophisticated metering systems that are capable of recognizing scenes based on pre-loaded data and make necessary adjustments to the exposure, essentially minimizing the use of the exposure compensation feature. Some cameras are even able to recognize the presence of people in an image, basing exposure primarily on people’s skin tones in order to reduce the chance of over or underexposure. Because of such advancements, our cameras might require less and less manual intervention by using the exposure compensation feature. However, no matter how intelligent our cameras are going to get, knowing how to quickly make exposure adjustments is still important, not just because you might need to use it one day, but also because you can push the limits of your camera by taking advantage of such techniques as exposing to the right. Although there is no such thing as “proper exposure” for every scene due to the fact that we as photographers often pick relative brightness of the scene depending on what we are trying to portray (such as intentionally darkening an image to highlight silhouettes, as in the image above), there are cases where one can make exposure adjustments using the exposure compensation feature in order to get the best out every image. This technique, known as “Exposing to the Right”, allows photographers to make images as bright as possible without blowing out any highlights, which essentially results in obtaining images of highest-quality possible. Be warned that this is not a beginner technique by any means though, as it requires shooting in RAW vs JPEG to get the best results. If you would like to explore this topic in more detail, please see our Exposing to the Right article. Hello Nasim. Thank you for your really detailed articles. I would like to make a small corrections, at least for the Nikon shooters. If you are on manual mode and you have selected a specific value for ISO, exposure compansation shifts the “correct” exposure of your light meter by the amount of exp.comp. For examble if you give a 3 stops exp.comp. then the zero of your light meter is also shifted by 3 stops and you end up with a very overexposed photo although your meter was on 0. Loannis, yes, that’s correct. I did not want to complicate the article by adding extra information on how Auto ISO + Exposure Compensation works on specific cameras – I believe Elizabeth already has some details about shooting in Manual Mode with Auto ISO turned on in her article. When shooting in Manual Mode with Nikon cameras that have the Auto ISO feature, the exposure indicator on the bottom of the viewfinder works differently than in other automated modes. If you start with a “0” meter reading, adjusting Exposure Compensation will not shift it – it will still display “0”, but it will adjust the camera ISO based on the exposure compensation value. The +- value in the viewfinder will not change, unless the camera is maxed out in Auto ISO. That is correct for Auto ISO. I am talking about when you choose a specific value for ISO for example 100,200,400 etc. Then and only then your zero on your light meter doesn’t reflect on a “correct” exposure but is shiffted by the amount of the exp.comp. Then zero will mean take the “correct” exposure and add/subtract the amount of my exp.comp. I hope that this makes it clear in regards of what i meant. When I choose manual exposure with auto iso turned off which is the way I shoot most of the time I do not use exp. comp. button. I just adjust exposure to move needle to the right (+) to lighten image or left (-) to darken image. Another words I leave camera on full manual most of the time. I can adjust exposure very quickly this way by turning the aperture dial or shutter dial, actually a little faster than fooling the exposure compensation button. You are right Larry.If you are in manual mode you don’t really need to mess with the exp. comp. button, because, as you already mention, you just adjust accordingly the values of the exposure triangle.I only made my comment to point out that the statement :”Unless one has Auto ISO turned on, exposure compensation will do absolutely nothing in Manual mode.” isn’t absolutely correct.If you introduce exp. comp. in manual mode you will end up messing with your light meter.The end result will be, although your light meter point to zero, your photos to be under or overexposed so many stops as your exp. comp. value. A little difficult to follow, but in essence, in manual mode, adjusting EC is pointless as it does nothing and is misleading as it causes the meter to appear to indicate over/under exposure. If this is then ‘corrected’ back to zero, over/underexposure will result. In manual mode the only sensible option is to adjust aperture, shutter speed or ISO, and centre the indicator for correct exposure. With manual + auto ISO, applying +/- compensation will adjust the ISO and the meter indicator will stay centred indicating correct exposure. 1) Mode M ; ISO -Fixed number(No Auto) ; Shutter(whatever it is), Exposure compensation shows 0 automatically. To help answer your question, I’ve just tried your three cases on one of my high-end Nikon DSLRs using: fixed ISO (not Auto ISO); Manual Exposure mode at f/4 and a shutter speed of 1/500 second. 1) Exposure compensation = 0: the viewfinder exposure indicator showed 0 because I had already adjusted the shutter speed until the indicator showed 0 for the scene in this example. 2) I dialled-in an exposure compensation of +2: the viewfinder exposure indicator showed −2; informing me that I needed to widen the lens aperture by 2 f-stops (to f/2) or to use a shutter speed that was two-stops slower (1/125 second). Making either of these adjustments caused the exposure indicator to show 0, as expected. 3) I dialled-in an exposure compensation of −2: the viewfinder exposure indicator showed +2; informing me that I needed to narrow the aperture by 2 f-stops (to f/8) or to use a shutter speed that was two-stops faster (1/2000 second). Making either of these adjustments caused the exposure indicator to show 0, as expected. As I stated in my previous comment, number 1.2.2: [The Exposure Compensation Control] does not change the exposure per se, it changes only the calibration of the internal meter. 1) Exposure compensation = 0: the viewfinder exposure indicator shows 0 because I had already adjusted the shutter speed until the indicator showed 0 for the scene in this example. I hope the above serves to answer your question. If it doesn’t then please feel free to ask further questions. Oops! My apologies for the replication. Thank you so much for detailed explanation. Appreciate your response. I love each line of this article..
First of all I would like to apologize for my late response. Secondly I would like to thank Pete for stepping in and answers this one. I agree 100% with what he wrote. If you are in Manual Mode and Auto ISO is off then don’t mess with the Exposure Compensation button. Nikon D810 iso 400, manual mode, exposure 0, and when I used +3 increments all the way to +1.5 the image appeared unchanged. Am I doing something wrong. The shadows were still black. i was shooting through a pain of glass at a zoo. If I am getting it correct, you mean that you took a photo with some specific values, you wanted it to be a little brighter, you changed the exp. comp. to +1.5 without changing anything else and you took the same photo again but the result was the exact same exposed photo.If that’s tha case then yes you did it false.You should have taken in consideration the new lighting measurement.If you have noticed the light meter you should have seen that now it was showing -1.5 . You should have changed accordingly one,two or all three of your exposure triangle values to try and make your light meter to point at zero!Please try again and let me know.At least with my D7100 this is how it works.I should say again although that when you are in manual mode with Auto ISO off there is no need to mess with exp. comp. because the camera won’t try and find the correct exposure by itself.Instead it will only shift left or right the light meter and it’s up to you then to balance the exposure.I hope that I made my self clear now. This control does not change the exposure per se, it changes only the calibration of the internal meter. 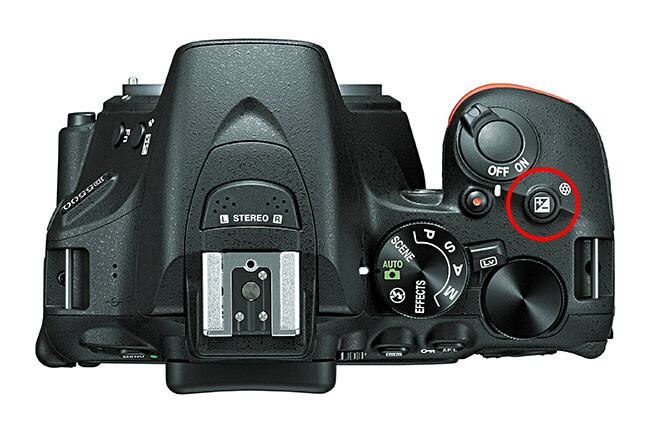 The operator adjusts the f-number and/or the shutter speed until the exposure indicator in the viewfinder shows 0. Obviously, if the operator requires +1 EV exposure compensation then they adjust the controls such that the exposure indicator shows +1. If the operator requires, say, +3 EV compensation and the exposure indicator is limited to showing the range −2 to +2 EV then the operator can set the exposure compensation control to +3 EV. Now, when the exposure indicator shows 0 it corresponds to +3 EV. The camera adjusts (depending on the selected Mode) the shutter speed, and/or the f-number, and/or the ISO, such that the exposure indicator is maintained at 0. The only means by which exposure compensation can be applied is via the exposure compensation control. NB: Manual Exposure Mode with Auto ISO does NOT change the exposure — only the operator can change the exposure. However, the exposure compensation control does change the brightness of the in-camera JPEGs as a consequence of changing the ISO. Thanks for this. It makes sense to me. That doesn’t seem correct. If you have a subject in front of a very brightly lit scene, the meter will respond accordingly and cause the image to darken towards the relatively darker middle grey, thereby underexposing the subject. Therefore, you would need to dial a positive number (+EV) so that the subject is properly exposed. Conversely, and perhaps equally counter-intuitive, for a subject in front of a dark background, you would need to dial a negative number (-EV) since the meter will want to brighten the scene towards the relatively lighter middle grey, thereby overexposing the subject. Ralph, to keep it simple, I did not refer to the relative brightness or darkness of a subject – I talked about the whole image after it is captured. If an image appears dark, you dial +EV, whereas if it is too bright, you dial -EV. Ok, got it. That certainly makes sense. Sorry, but this is so dumb. So for everyone else: shutter speed down. R, not sure what is so dumb – we are talking about basic exposure compensation here. Please read the article and if you have any questions or comments, please let us know. Good article. 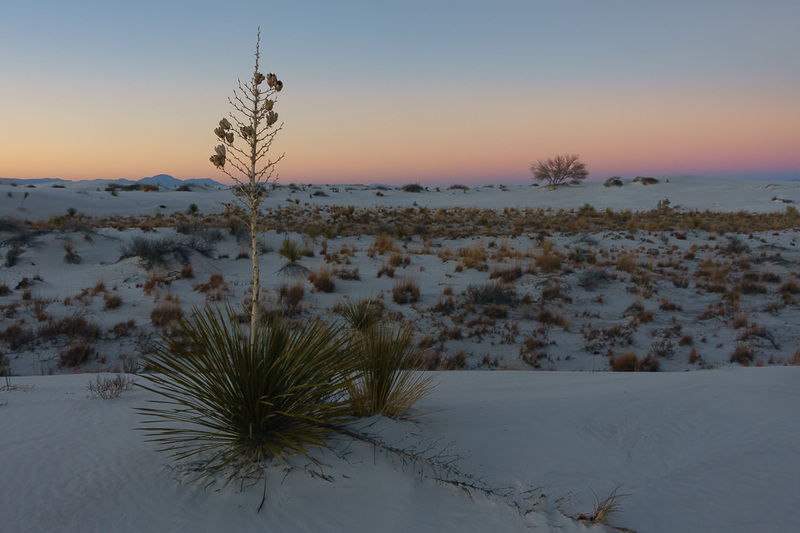 If one aims at getting it right in the camera, rather than process to correct, this tool, along with using our feet to adjust the composition, is a favorable option for dialing things in – so minimal RAW tweaking is needed to yield an image. Mark, thank you for your feedback, glad you’ve enjoyed the article! It looks the camera has changed the shutter speed to a lower value 1/6 from 1/13. That would also increase the exposure. After sticking to auto for many years I am trying to move to manual. I understand the theory. But problem I am having is remembering all these combinations. Anpu, that’s exactly what happened – after I adjusted the camera’s exposure compensation, I was able to expose the scene 1 stop brighter, so the exposure time was increased as a result. What I was thinking is this – why you could not do that by slowing down the shutter speed by 1 stop without +/-. Hence I made the previous comment after looking at the text below the pictures without reading the full article. Now I am going to read the full article to understand the whole thing. The reason is that Nasim’s photos were taken using Auto modes (Aperture Priority and Shutter Priority). The camera is in control and will adjust aperture/shutter speed to always maintain the same overall exposure. EV Compensation is a Manual intervention which overrides what the meter wants to do. We are imposing our will on the dumb meter! In manual mode, you would be right, we could just adjust the shutter speed/aperture by 1EV and the result would be the same. Thank you for this article, Nasim. You do a great job simplifying the process. You state that, “Dialing in -1 EV via exposure compensation will decrease the shutter speed from 1/250th of a second to 1/500th of a second,” when in fact changing the shutter speed from 1/250th to 1/500th is an increase in shutter speed, however it does decrease the amount of light hitting the sensor. Eston, you are right – I meant to say decrease the amount of light getting into the camera, but your wording is more technically correct, so I updated the article. Great article. Thanks for sharing this, I never understood the exposure compensation on manual mode, on the Nikons. it was you who taught me to use exposure compensation (EV for a Nikon). And, I thank you very much. I adjust the exposure all the time with EV. In hand-held photography, -EV slows the shutter down to boost the exposure. That is a factor in very low light when you are trying to hold the camera steady at 1/30 of a second. Your cactus shot is on a tripod. After I corrected the EV to make the exposure look correct, I would have additionally made a bracket of 3 images from that setting ( -1/3 EV, 0 and +1/3) for insurance and blended them later in PS. I have been following your site for 9 months and have learned a lot. Thank you again for all of your efforts. I shoot 99% of my pictures in manual setting. I realise that exposure compensation does not work in manual setting. However, I still don’t get why people use exposure compensation. If the DOF matters I set that and then if I get the shutter speed wrong I change that. Conversely if the shutter speed matters I adjust the dof. If that is not right I consider the ISO. Is that not the whole basis of the photographic triangle. Why use another setting when you don’t have to. Help me understand! Exactly. It is good, however, to understand how it works outside of manual mode. My concern is that I would be in a non-manual mode, enable it, forget about it and wonder why some of my pics are not exposed properly. Hence, why like you, I shoot in manual mode almost exclusively. Mark, please see my response to Marie below – hope you will understand why people like using this feature. I like how you have provided images of the exposure compensation buttons and dials, and your explanation. I learned to manually use exposure compensation with film, before digital existed, and only read your article out of curiosity. My camera does what I tell it to do–by that I mean that I shoot only in manual and I am selecting the aperture and shutter speed. I’ve done this so many times with film cameras and now digital cameras that I know what combination of the exposure triangle to use based on my experiences. I do use the bracketing feature in my digital camera set up in 1/3 stop increments as fine tuning. But I would be unlikely to want to give my current manual control of my shooting habits over to my camera via digital exposure compensation because it may damage my current knowledge of which aperture and shutter speed to use based on the scene, lighting conditions, and my other camera settings, such as ISO, White Balance, and how I desired the scene to appear in the end result. I do think that it is good to know what your camera is capable of doing, and to also understand that because your camera can do something doesn’t mean that it is best for your creative practice to use every one of those possible features. As with your example photo of the snow scene, you could have simply manually increased your aperture opening or decreased your shutter speed manually to get the desired result. Surely this was not a rapid fire situation. You had plenty of time to make aperture or shutter speed adjustments manually and therefore increase your understanding of which exposure triangle settings to use in snow scenes. What would be the reason to add the intervening step of pressing the exposure compensation button and and making adjustments just for that scene. Then the adjustment would need to be reversed for a different scene. Why add the additional camera adjustment into the mix? The human mind can think faster than the camera and the photographer decisionmaking process is part of the art of photography and I do not wish to eliminate or reduce that involvement. With respect – it’s great that you have developed a process that works for you. That said, you shouldn’t knock the chance that others (not shooting auto – which is most) might like to approach it differently than you do – with more options. With wildlife, many shots are instantaneous, to get the action, so choices have to be made quickly – not a series of three – which, in my world is called “spray and pray” though more often a reference to those who like to point and pull the rapid fire trigger – then get back to the office to see if they got anything. I shoot aperture priority, so never willing to allow the camera to make changes to that parameter for the sake of “correct” exposure. Choosing ISO and tweaking EV are my best options for dialing in the exposure. Typically, I take a test shot, or two, for more extreme scenarios, but most critters stories don’t benefit from wild exposure scenarios – for the sake of “art” so it’s mostly easy to dial things in with that test shot, then wait for the point of action that tells the story I’m aiming to tell. Yeah, these comments loosely reflect my approach. I select the ISO, based on general lighting conditions and Aperture Priority, based on the composition and lens choice, then pay attention to shutter speed relative to the action in the scene. I adjust ISO to get the shutter speed I need to get the shot I intend (how much action do I want to stop?). I use exposure compensation as needed to improve contrast, or address gross lighting issues that the camera will interpret other than I intend. At the end of the day, one can argue for a particular way of shooting out of arrogance, laziness, etc. And, really, it doesn’t matter. There are reasons for various options, but at the end of the day, each just needs to be content with “the man in the mirror” since the real litmus test is the image itself. Does it do the best it could to tell the intended story. Only the shooter can know that. In my experience, I find that most of my weaker shots are so, not because of camera or lens error, but lack of paying (enough) attention on my part. That is, not taking that extra step forward, back, or to a side, that would have better isolated the subject, or changed the angle of light, or removed a distracting element from the scene. For my tribe, I’m willing to let the camera do some of the calculating so I can focus on the far larger list of elements that can get in the way of the critter being the hero I intend. In many instances I’m getting the privilege to se a critter most will never see (in person), and/or behavior that most will never witness (even on TV – it’s amazing how much gets edited out of “nature” media. It’s a high responsibility to tell that story in a way that reflects the critter and it’s environment. I aim to have as many variables on that checklist of options, and just a few of them have to do with ISO, AV, or EV. You deserve kudos for your website and for your thorough explanations of various elements of using a modern DSLR camera. This was helpful as usual. Also, thanks to you and John Bosley for your great video courses – very well done! Thank you for your feedback Dewayne, we really appreciate it! Does anyone else think that the newer Nikon models tend to underexpose? I’ve moved from a D90 to a D7000 to a D750 and also a D500. With the same lenses, settings, and shooting scenarios with all of these cameras, particularly in lower light, I find I have to frequently dial in +EV on the D750 and D500 but never had to do it with the D90 or D7000. Have Nikon adjusted their exposure algorithms, and if so, why? Yes, at least with the D500. I think they’re designed these days to protect the highlights at all costs, so they underexpose more than a D90 (another camera I’ve had a lot of experience with). Yes, I believe the algorithms had been adjusted. I’ve used 4 Nikon cameras. D70, D300, D7000, D750. D300 is the most conservative IMO compared to the other 3. When I use my D300, I always compare it with my D70. The D300 will try it’s very best to preserve the highlight so when you’re shooting with a backlit foreground, the subject will always be dark / underexposed. I always thought that my D300 is faulty. It took me a sometimes to accept that it’s how D300 behaves. IMO, of all the 4 models I’ve used, D300 is the most conservative with highlights. D750 and D7000 tend to be a bit overexposed (guestimate around 3/4 stops). But it’s easy to recover those highlights back with D750. In my experience, the Nikon cameras tend to over expose. I typically have dialed in -0.3 or -0.7 most of the time. D300 was my first DSLR, but have owned several since then. Currently that is the D5, D810, D750, and D500, but I have used several full frame and even more cropped-frame cameras over the years and find this to be generally true, for the kind of images I want. There is some variance body to body, but I also think the higher end the cameras, the more consistent they are. I’ve used several of the consumer cropped sensor cameras and I found much more variance camera to camera, in essence, the less I invested in the tool. Decades ago, I started using colour reversal film [aka: slide film; transparency film] in various makes of SLR cameras. I found that their inbuilt light meters were more than reasonably accurate when they were used correctly. In other words, the factory calibration procedures used by each of the manufactures was held to a standard that we would reasonably expect for expensive cameras. Furthermore, I found that the consistency between the light meters to be so good that I switched from using over-the-counter film stock to bulk purchases of pro-grade film stock which required being stored in a refrigerator. My first auto-focus Nikon film camera underexposed the film, which was swiftly corrected by taking it to a Nikon Service Centre — the technician also corrected a minor auto-focus error discovered during the test and alignment procedure! My first experience of digital cameras was years ago using a highly-recommended small-format compact camera. I still use it sometimes — especially for macro photography of butterflies and other critters — because it produces wonderful JPEGs straight out of the camera (it doesn’t have an option to output raw data). Its evaluative metering system is superb, as is its live view (it has no viewfinder), and it’s easy to dial-in exposure compensation on the rare occasions when its meter ‘gets it wrong’. Now, imagine my surprise when a few years later I switched from using Nikon film cameras to the D3 series: Why on earth do I now need to dial-in negative exposure compensation (often -0.7 EV) to produce JPEGs that resemble properly-exposed colour reversal film? Why do these top-end Nikon cameras get exposure usually wrong when my compact digital camera and my film cameras usually get it right? These two simple questions sent me on a very long voyage of discovery because they made me seriously question whether my self-perceived in-depth understanding of optical physics was fundamentally flawed, or if it was scientifically correct. The devil lies in the details [I adore the double entendre in this commonly-used idiom]! In order to start understanding the discrepancy, I thoroughly recommend reading the Wikipedia article entitled Film speed — especially the subsections The ISO 12232:2006 standard and Standard output sensitivity (SOS); and their references to the CIPA DC-004 standard. CIE 1976 standard “mid grey” has the brightness value of L* = 50; a level of precisely (33/58)^3 ≈ 18.42%; an sRGB level of 119; an Adobe RGB (1998) level of 118. An 18% grey card, or an 18% grey square on a colour chart, is not required to have reflectance of exactly 18%; it is seemingly required to have only a reflectance that is [an unspecified] somewhere within the region of 18% below the reflectance of the material on which it is printed, which will always be less than 100%. Even colour charts which claim to be a genuine ‘Macbeth chart’ frequently do not conform to the strict CIE definitions of their colours. For those who are considering purchasing such charts plus camera profiling software: caveat lector and caveat emptor both apply! It has been frequently stated on the interwebs that modern cameras and external reflective light meters are calibrated to a scene reflectance of 12.5% (precisely 3 EV below 100%). If this were true then the corresponding sRGB level and the Adobe RGB (1998) level are both 99 (ref. max level 255). 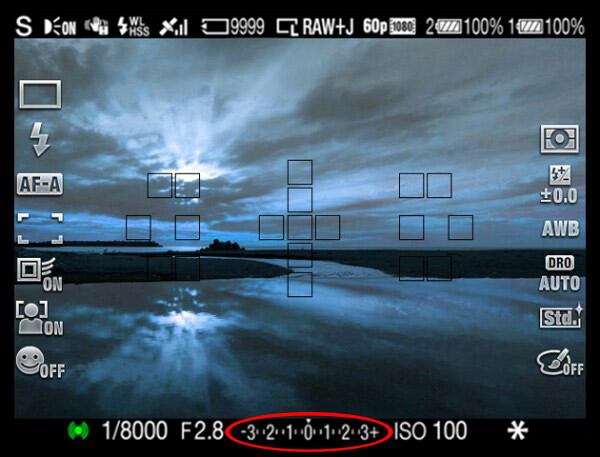 The high-end Nikon DSLRs have an option for fine-tuning their meter calibration in steps of 1/6th of an f-stop. What happens if shooting in aperture priority with Auto ISO and you’re at the limits of your Auto ISO settings, and then exposure compensation is applied that would violate those Auto ISO settings? For example, let’s say the aperture is set to f/4.0, maximum ISO sensitivity is set to 3200, and the minimum shutter speed set to 1/500. Now let’s say you’re in a lighting situation where your camera’s metering determines proper exposure is f/4.0, 1/500, and ISO 3200, but you decide the image needs to be overexposed by one stop so you dial-in +1 EV of exposure compensation. What gives, the shutter speed (would need to go to 1/250, which is below the set minimum of 1/500) or the ISO (would need to go to 6400, which exceeds the set maximum of 3200)? Thanks Nasim, for another good article. In P mode when the normal parameters run out, shutter speed is adjusted until you reach your selected minimum shutter speed at which point ISO is adjusted. In A mode the shutter speed is adjusted until you reach the selected minimum speed at which point ISO Auto is adjusted. In S mode, aperture is adjusted until you reach full aperture at which point ISO is adjusted. In M mode aperture and shutter speed are fixed (unless you manually adjust them) and so Auto ISO is invoked from the start. When you hit the bump stop for ISO Maximum Sensitivity, the camera will override the minimum shutter speed and try to produce an acceptable exposure. The bottom line seems to be “shutter speed rules OK”. I am happy to be corrected on this as it is a murky subject and what happens with other cameras may be different. Excellent article and useful for beginners. Practical aspect and usage manner addressed. Thank you for your feedback Godwin! Get more for your exposure adjustments. I set my Nikon D700 to exposure bracketing (5 shots plus/minus 1 EV). I pick the best, or…I now have an opportunity to make a HDR image by combining all 5 exposures in Photomatix. Assume your subject is not moving. Peter, while exposure bracketing works great in many situations, I would strongly advise against keeping that parameter as a default. While it costs nothing to take extra shots, it does take a toll in terms of your time when it comes to image culling, importing, backups, archiving, etc. I would only do exposure bracketing when one doubts that their camera can capture all the details. You’re correct, generally speaking. I’m retired so time is not an issue. This is equivalent to spray and pray – a shotgun approach for those who have no idea. I spray every time I do landscape photography…keeps the ticks off. Good idea. I do too when shooting wildlife. Nevertheless it’s also a good idea to understand metering. With wildlife, as often as not, you get just one chance to get it right. Sleeping lions are an exception – they sleep most of the time, so getting it right is not a problem. Nice Article Nasim! Clear and concise. On a different note, If I am using my camera in manual mode and using an off camera flash in TTL mode, does it matter what metering mode I am using? I mean will the flash output be different if I change my metering mode from evaluative to say spot metering or center weighted metering? Girish, shooting in manual does not mean that you don’t get the camera meter reading – it will always be available on your camera’s viewfinder / LCD. So if you switch from one metering mode to another, you will still be able to judge your exposure pretty accurately by looking at the meter reading. Now when it comes to flash, that’s a whole different beast, since flash exposure works differently than regular exposure and that’s also why there is a separate flash exposure compensation button. And yes, your choice of metering should affect the TTL flash output, even in manual mode, since TTL will try to compensate for any changes in the camera’s meter. But I believe this particular feature differs by brand. Yes, because each of those three metering modes ‘looks at’ the scene in different ways and will indicate a different (and probably incorrect) exposure for each one, unless you are metering very carefully and choose the exact same tone for all three modes. If you metered from say, a grey card, the flash output would be the same for all three exposures. If you point your meter at a general scene with a range of tones, the flash output would most likely be different for all three. If the metering is wrong, the flash will not make it right. I only ever used manual cameras with film, (back in the distant past!). These days, if I was using manual mode and felt that the cameras “opinion” needed correction it wouldn’t even occur to me to look for an Exposure Compensation control, I would simply change aperture or shutter speed directly – or, if I remembered, ISO – and what a luxury that is! What I would not forget is that I can often do a lot of bracketing for no extra cost – another luxury! The skill that has to be learnt is identifying situations where intervention is necessary. A nice article, clear and well illustrated! Thank you for your feedback David, glad you’ve enjoyed the article! I meant to add, until I was interrupted (by life) that what I do find confusing is all the “intermediate” shutters speeds that can be found opn a modern camera. It used to be the case that one click on the shutter speed control was one stop. You could compensate by ear! You can still compensate ‘by ear’ – three clicks (instead of one) per stop! I also agree with you – modern cameras are often too clever for their own good. There are now so many modes and options that is easy to either forget which option has been set or get caught in a circle of confusion about what the camera is going to do in a particular mode. Manual adjustment is quick, easily understandable and covers all situations. You did a good job of explaining this feature. However, are we talking here about exposure compensation, or flash intensity adjustment? I’m not sure they are equivalent? Both have a “+/-” control so it may confuse some people. In your image of the EVF it is the flash control that is circled in red as evidenced by the thunderbolt adjacent to the +/- symbol. That is not the same as the plain +/- control used to compensate exposure when flash is off. Thank you for pointing it out – I had an updated image that I uploaded, but the cache did not clear it for some reason. Please CTRL+F5 to force the refresh of the page and its images and the updated image should now be fixed. Can this procedure be done easily in Lightroom or Photoshop if you shoot in RAW? My finger always seems to cover the compo button if it is on the shutter button. Sounds like you have really big, heavy fingers.? A) That silhouette shot was terrific!! B) Every article like this, e.g., ISO Invariance, ETTR should have a mandatory concluding sentence something like: “Before your respond, go out and experiment with what has been discussed. After analyzing a thousand or so shots, feel free to comment”. Reading about technique is one thing. Actually shooting and reviewing results is where you learns what works for you. I love my Canon 5d mark 3; however when it come to EC it falls way short. The only way I can get to EC is by going through the menu. Hi, I am a “mature” photographer who began with film and manual cameras. I am sometimes annoyed with all the talking about technology and not enough about technique but… I am currently working with two Oly EM5II bodies always in aperture priority. There are complex, high contrast subjects such as alternating bands of darker clouds and bright sky (especially at sunset) where the camera can significantly change exposure just by moving it a little. With the EVF set to changing brightness with the exposure and the histogram showing, exposure compensation always lets me re-center the histogram very quickly while exploring different compositions. A little bracketing takes care of most additional unpredictables (and leaves the door open for some realistic HDR when called for). This lets me work faster and increase the % of keepers. Nasim, I own a bridge camera Fujifilm s7000 (2003 year). I spent so much money on learning using books etc but nothing helped more than your articles. Big Thank you ! Never used EC. Never will. Just don’t see the need. I can make any/all adjustments in LR and/or Photoshop.